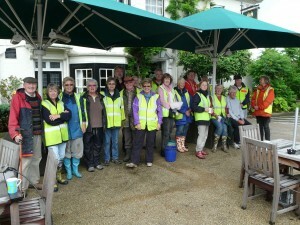 The Liphook in Bloom team are all volunteers and would love your help and input. We generally work on the flower beds around the village for one Sunday morning a month. Sometimes we meet more often, perhaps on a Saturday or a weekday during busy times like planting, or if we have a special project in progress. The watering teams are out and about for a couple of hours or so 3 times a week, and the more teams of 2 we have, (one to drive and one to water) the less often they have to water! It’s not all weeding, planting and watering – we do much much more! We have projects that need people prepared to do manual work. If planting and weeding aren’t your thing, put your name down to help on a special project, some extra muscle would be really helpful on occasions. But it’s not all work, we take time out to relax and socialise. We always stop for coffee, chat and kit-kats on our working days. We have a Summer Party and a Christmas Dinner and occasionally meet in the pub for a drink. But just to reassure you, we fund these occasions ourselves, the sponsorship money is used for the village benefit only. Join Liphook in Bloom and you see the result of the work you help with every day when you travel around the village and see the plant displays or fruition of a special project (for example, the map board outside the Parish Office) – it’s a great sense of achievement. Join Liphook in Bloom and meet new friends – we’re a friendly bunch of all ages. Join Liphook in Bloom – it helps to keep you fit, a good way to exercise! Please come and join us – you don’t need to make a huge commitment – we’d love to see you, whether that’s once a year or once a month. Please help keep Liphook a great place to live, work and play. If you are tempted to join us, come and have a coffee and chat outside The Anchor at 11 o/c on our Working Days, or drop us an email.